Taking a slight detour from my Christmas 2014 comics to write this as X-Men 100 reminded about the one scene from this oneshot. The basic premise of this issue, that really works as a handbook with a fun framework. 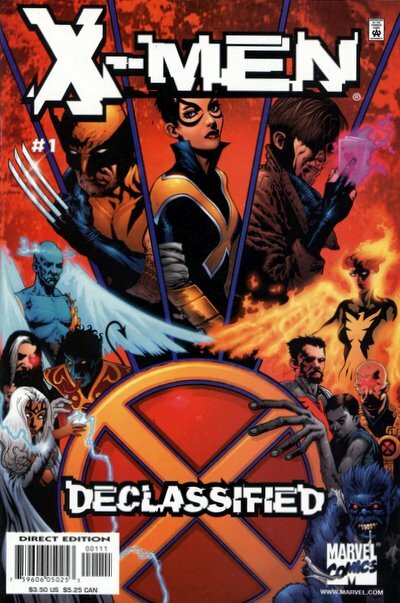 The framework is that three X-Men – Gambit, Wolverine and Shadowcat, are trying to get the information that Bastion stole from them back in Operation : Zero Tolerance. Once inside the base, Kitty tells the other two to split up, as that is the fastest way to find Bastion. Gambit finds some prisoners and touches a wall and we are treated to Rogue’s profile (not sure how that exactly works but that is how it happens). So for the purpose of the issue, either the X-Man sees an image that leads to the profile, or the profile comes first and then they are treated to a private – yet to be revealed secret. As twelve year old Rogue is walking across a bridge, when a giant pink creature comes up and absorbs the little girl. The being calls itself Rogue. So really, after this first secret, how can you even believe the other secrets that are coming. 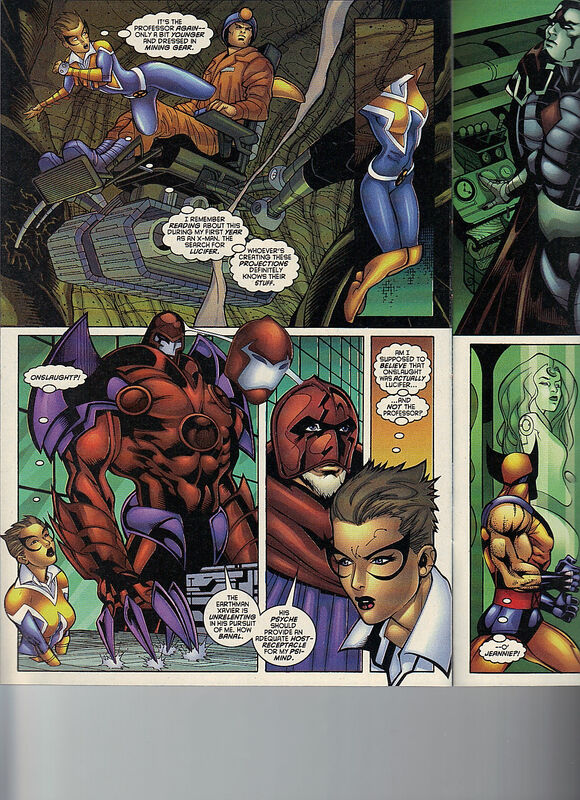 Kitty sees some text that shift into the language of the Shi’ar, which reveals Colossus’ profile. Kitty sees an adventure that Magneto’s Acolytes (that Colossus joined during his sister’s funeral) when they teleport to a Russian space station that has ventured to close to Magneto’s space station, Avalon. They straight up murder all of the Russian scientists. So this probably happened. Wolverine comes across non-furry Beast. Why all of these holograms are active, is beyond me. Hank turns blue and injects himself with the Legacy Virus, which we know never happened. Kitty is forced to read X-Man AND Cable’s profiles, luckily she gets to fight some members of the Hand. She sees Gambit’s profile as apparently when he was part of the Thieves’ Guild, he made an alliance with the Hand, which could easily have happened. Wolverine sees something that we all already know, Mystique is running away with a white baby who turns blue, which is of course, Nightcrawler. A bit of a waste of a page but Nightcrawler doesn’t lend himself to foolish fake secrets. Gambit sees Psylocke’s profile, leading to a scene of X-Men 100 (I’m not sure when this story could take place as Kitty is there, in her X-Men 100 costume but she is missing until issue 110, but with a hint that she is okay in 109). I guess it could have taken place between 109 and 110, as Wolverine is told in 109 that she is okay, why would he pretend like he didn’t already know that if this adventure took place before 109. Psylocke’s secret is that, like Jean in Uncanny X-Men 100, as the X-Men in a space shuttle, are crashing back to Earth, the Phoenix force appears before her. Which is pretty clever. Kitty sees Xavier’s profile and leads to a memory of him as Onslaught. Kitty is like me, and doesn’t believe that Lucifer, who first crippled Xavier, and has the same color scheme as Onslaught, was the main influence of Xavier’s choice of Onslaught. Which is pretty silly, as red and purple is clearly Magneto inspired. Wolverine is now in a replica of Mister Sinister’s lab, which is filled with tubes of clones of Jean Grey. There is a implied that the Jean found at the bottom of Jamaica Bay, is also a clone. Gambit sees a flashback of Thunderbird, as a younger man, mistreating mutants. Kitty sees a young Storm, back in her Cairo days. It is implied that this entire time, Storm is nothing but a puppet slash vessel for the Shadow King. 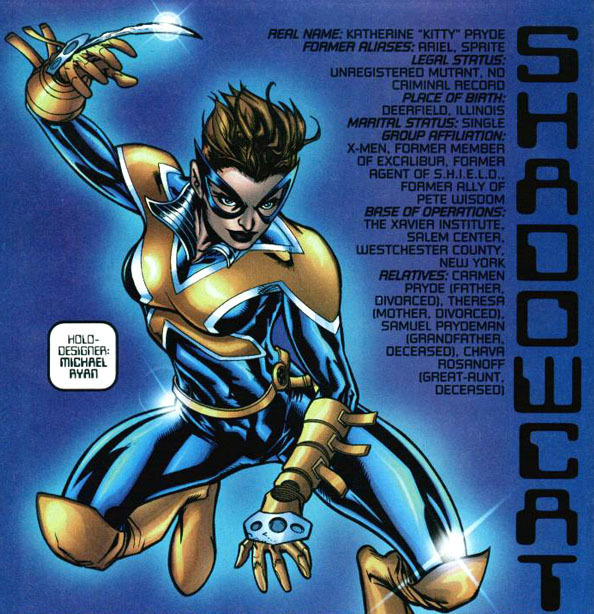 Michael Ryan draws a great Shadowcat! We get to the scene that got me to review this issue. Wolverine is in an Illinois nursery. 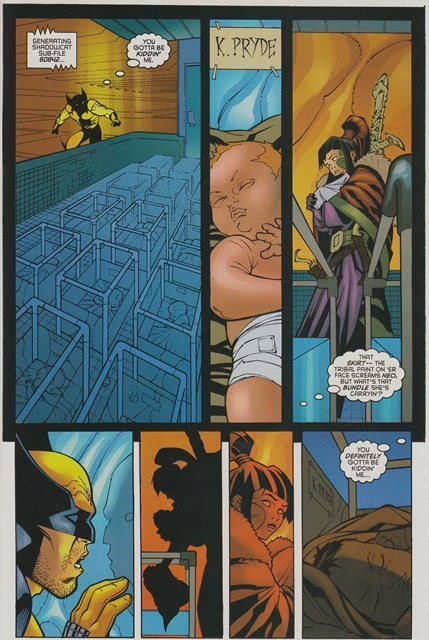 He sees a newly born, K. Pryde, and a member of the NEO, who is swamps K. Pryde for what we are to believe is the Kitty Pryde that we know today. Which is so clearly fake and super silly. But it is the earliest possible appearance of Kitty Pryde. I suppose, it really isn’t as it scene never happened. 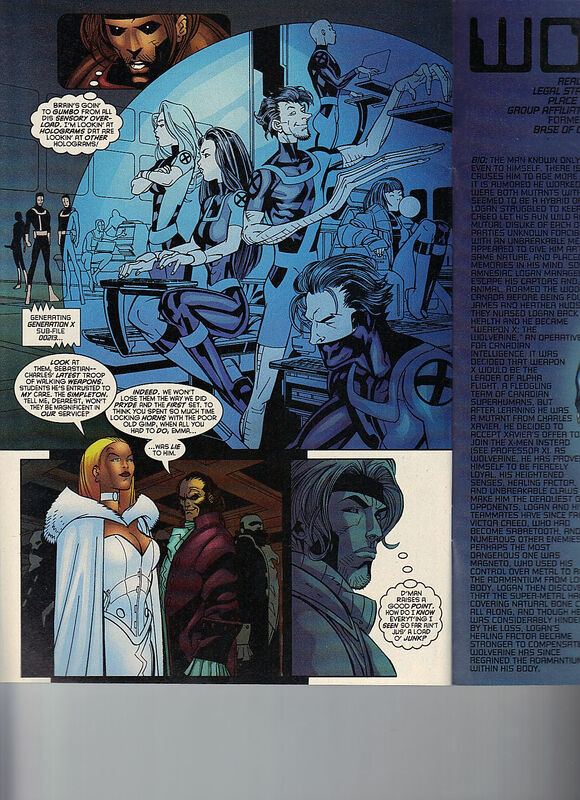 Gambit sees Emma Frost and her team, Generation X. He sees Emma talking to Sebastian Shaw, as she plans on turning the team to the Hellfire Club. Shaw references how they lost Kitty, and that isn’t ever going to happen again. Kitty sees Wolverine’s profile and then sees Apocalypse force Wolverine to regain his adamantium skeleton but it is implied, like the rumor ending was suppose to be of Barry Windsor-Smith’s Weapon X origin story was going to reveal Apocalypse being the mastermind of that storyline. 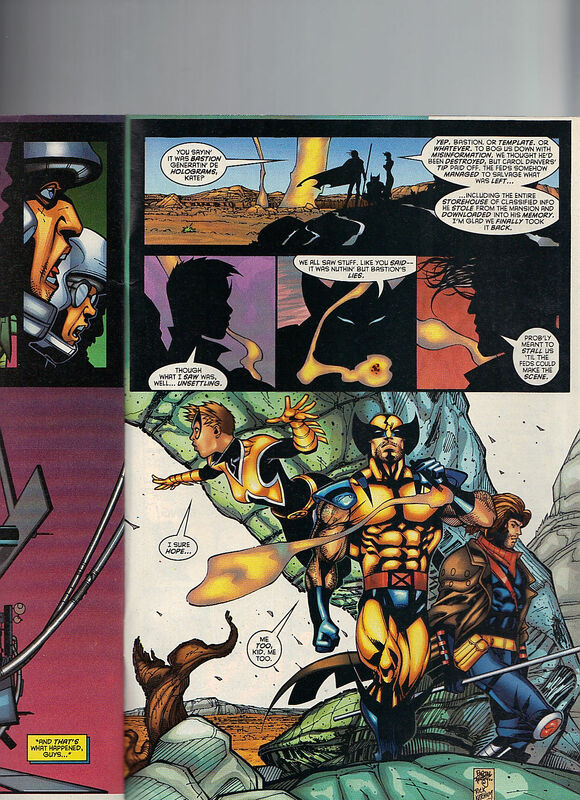 Wolverine sees X-Force confronting Magneto, while he was the King of Genosha. Cannonball threatens that if Magneto gets out of line, he will end him. The three X-Men meet up and start fighting each other. Gambit strangely calls Kitty, Katie, which couldn’t be more wrong. Issue ends with Kitty, who Gambit calls, Kate, so I will have to pay attention (whenever I review the 35th Anniversary issues) if Gambit always calls her Kate or not. Kitty explains how Bastion was malfunctioning and Carol Danvers told these X-Men where to find him. None of these secrets ever came to light, so they are all false. Bullpen Bulletins. On sale next week – Black Panther 25, written by Christopher Priest / Cable 86 / Generation X 70 / Spider-Girl 27 and X-Men : Search for Cyclops 1. Jean and Cable are looking for him, as they don’t suspect he is dead when Apocalypse merged with him at the end of The Twelve storyline.